In business world, PowerPoint presentations are vital to business success, which are commonly seen to present ideas, share development prospects, introduce products, and so on and so forth. All too often plain texts in PowerPoint slides are so dull that they cannot fulfill the presentation expected results, thus PowerPoint in commercial templates or with unique logo to protect it becomes trending these days. Let’s take a deep look at the commercial PowerPoint. Commercial PowerPoint slides have various themes and categories, catering to different use for different occasions. By taking advantage of these theme templates, we can make professional PowerPoint slides in an efficient way. Furthermore, commercial PowerPoint slides are more powerful than those randomly made PowerPoint presentations. They will give a professionally made layout for users to put text, images, or audio material in the slide. This will achieve a perfect balance among a range of contents, ensuring the best outcome for presentations. That is why commercial PowerPoint has earned so much popularity in the business world. To make things better, we are now able to share some tips to make a commercial PowerPoint easily. The first and the most important thing is that you should be well aware of the theme you like to make in your PowerPoint, for example, production promotion or event planning or else. Then you may choose the relevant template to fill things in. Before getting to the point, we need to mind several tips in order to make the commercial PowerPoint more powerful. - Be absolutely clear about your goal. Just stick to your goal and state the most important things in a precise way. - Learn about your audience. Spend some time to think about who your audiences are and what they want from your presentation. Note your audience will get bored if you put plenty texts in slides. They would rather read than listen to your presentation. - Include chart, table, image, or even voice in the slide. To make your slides more attractive, there are tons of ways to make them look good and eye-catching. As the saying goes, an image says more than a thousand words. - Protect your work with a unique logo. Copyright is important for the presentation owners so if possible, add a unique logo to the file. You are surely able to fulfill a PowerPoint commercial version if the above tips are taken into consideration. In the following, I will be honored to share with you how to make a PowerPoint commercial presentation sample with a unique logo attached. Usually I would choose Leawo PowerPoint to DVD Pro to help me add a logo to the PowerPoint slides, and it can also help me convert PPT slides to DVD. 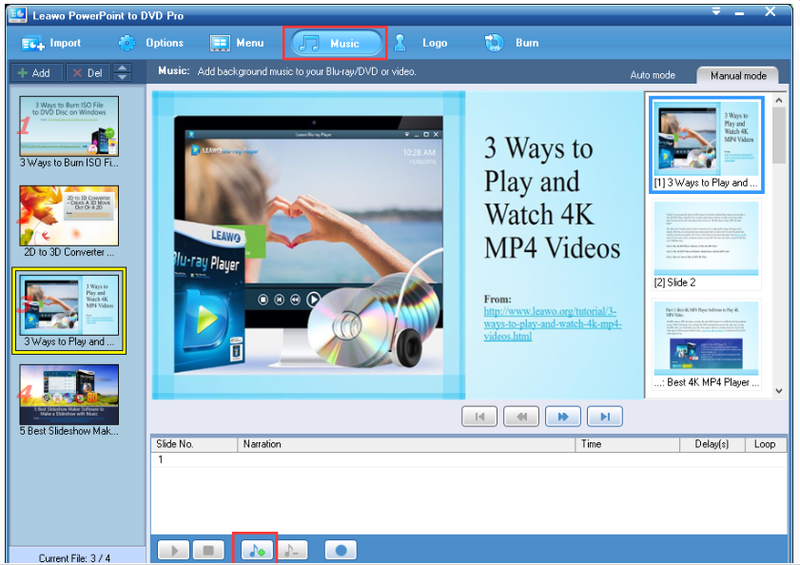 Simply put, this program is developed to convert PowerPoint to video and burn PPT to DVD/Blu-ray with customized menu. As said, this program could convert and burn PowerPoint to DVD for playback on TV and DVD player, making PPT slides more enjoyable. In our case today, we can show you an example to add a logo to the PPT slides and burn the PPT to DVD. With a user friendly interface, you will soon get used to this program. Before getting started, you should make sure this program is installed correctly on the PC. Click here to install. Step 2: Import your PowerPoint slides. On the tool bar, click Import to add your source PowerPoint slides to the program. On the right pane, you can set the playback option. Step 3: Click Options to select the target service type. Here we select Create Standard DVD. For the DVD options, set as follows. 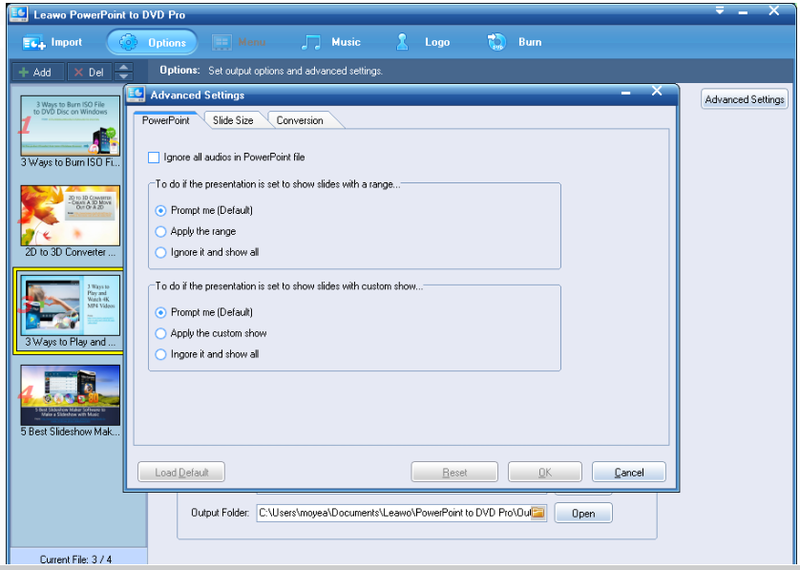 Enter Advanced Settings from the right to set more specific parameters for the PPT file. Step 5: Choose a menu template. Hit the Menu tab to choose your favorite template. Note these are free templates for users to try. Step 6: Add music to the PPT file. Many people would like to add some music to improve the PPT performance so they can click Music to add any music they like. Step 7: Add a unique logo to the slides. Click Logo to include a unique logo to the file. This will protect your file from being copied or edited. Click Burn > Start to start the process of burning PPT slides to a DVD. The below green bar will tell the real time status of burning process. It is very convenient to monitor the process. After a DVD is made, you will be able to play it on any media player or TV for better presentation. A commercial PowerPoint can be made easily with the help of commercial templates, which are available everywhere on the internet. To make the PowerPoint slide more powerful and to protect your work and effort, put on a logo to your slides. Leawo PowerPoint to DVD Pro can be your best choice to achieve this. By the way, with this program, burning your PowerPoint slides to a DVD will definitely make your PowerPoint more enjoyable.